ASUS SpaceLink WL-110 CF Card Driver for Win98SE/ME/2000/XP. ASUS WL-110 CF Card Driver, Utility and Utility release note for The WinCE 4.0 & Pocket PC 2003, English Version. a. 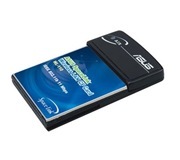 The Zip file contains setup program for ASUS WL-110 CF Card Utility and Driver. 1. Support Multi-language. 2. Change WiFi to Wi-Fi.